President Obama's new smartphone is reportedly a Sectera Edge made by General Dynamics. WASHINGTON (CNN) – It’s likely to be the most exclusive e-mail list in the world: Just who will rate access to the presidential smartphone? “The president has a BlackBerry,” White House Press Secretary Robert Gibbs said Thursday, clearing up weeks of speculation about whether President Obama would be able to hold on to a cherished method of communicating. The decision to allow Obama to carry a smartphone is “a compromise that allows him to stay in touch with senior staff and a small group of personal friends,” Gibbs told the media in his first press conference since inauguration. Gibbs said the 44th president’s e-mail traffic will – with some exceptions – be preserved for historical purposes. 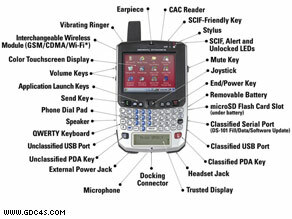 Although Gibbs specifically mentioned the BlackBerry, Obama’s device is reportedly a Sectera Edge, a model from General Dynamics that is capable of encrypting top secret voice conversations and classified documents. For the love of pete people...it's a phone. It's not some international tool of terrorism. Still looking for WMD's are we? In a world where technology is developing and changing rapidly, it's refreshing to have a leader who is willing to be a member of the here and now. I'm so sorry that for 8 years we suffered a president who was so out of touch with reality that it becomes news when Pres. Obama wants to have a blackberry. Pathetic. I think its refreshing to see a President so obviously in touch with technology. And how is this important in governing the country wisely? BarackBerry, Barack the Vote, etc. Did we just elect Batman president? What's next Barackarangs and the Barackmobile? What about the Out Put??? There are lots of Places I don't have access to... Nor them Me... But?? It is just a bunch of Electronic Components, and a Keyboard..
Mark my words...this will go down as the first really boneheaded moves on the part of our new President. NO network is 100%, 100% foolproof. When he became President, he lost the right to text message his family. Sorry, that's the way it is. It's too bad that this president does not understand technology enough to know that even having the blackberry turned on betrays his physical location. Didn't see that particular model in the T-Mobile line-up (they're listed as a carrier for the Sectera Edge on the General Dynamics web site). Why aren't we all protected with the same level of security on our mobile devices? My communications are just as important to me (and with ID theft run rampant, corporate crime, and litigiousness in this country, we deserve equal security). excellent! barack obama is on top of technology where his predecessor failed miserably. after reading the new administration's plans for cyber security there is no doubt the blackberry will be secure. You won Obama. You & your black berry. Good for you. "Sorry, I remember now Journalism died in 2008." Are any of you old enough to remember the movie "Network"? If not go to netflix, get it, and check the date before viewing it to put things in perspective about just how accurate this portrayal of the fall of the media was. "Only a fool would even attempt to hack the President of the United States Blackberry, or post the email/phone number on the Internet, if one of the privileged few given the information." Again, stop thinking everyone is subject to U.S. laws. I'm bettting the Chinese, Russias, several mid-east countries, terrorist groups, etc.. are already planning if not trying. The government has been repeatedly hacked, successfully, at some of the highest levels. The NSA, CIA, and FBI are probably constantly reviewing access to the device and the servers it communicates with to see who is attacking. Probably using the Patriot Act to justify this accesss as well. If you truly believe that only fools will attempt this, you're as just as naive as others are claiming Obama to be. Then again, you probably believe those Mac commercials that knock Microsoft but fail to say anything about their own systems which by the way require more updates than most Microsoft systems. Electronic espionage is the future of political power, warfare, and criminal activity. The Information security community is rightfully concerned about Mr. Obama's obsession with social networking tools. Disclosure could just as easily be unintended and without malice, but once released used in that manner. "Daniel Cabrera" (sure thats your name). Grow up! I pity your pessimism. Especially because your last sentence was a question that has already been answered by a vast majority of Americans. Why would the question even be posed. Does anyone know there history? We've never seen this kind of turn out for a president before...so that has to mean 1 of 2 things. (1) Either Obama is very good for as far along as hes come....or ...(2) the previous admin was that bad....either way its pretty tough indictment on those who voted for Mccain and whether frustrated with the loss or otherwise, just cannot seem to get behind and support our current President. It has to reflect a lack of general perspective. I understand what its like to livein a State that is as Red as the "submit comment" button, but I do not let that lack local of perspective or pack mentality influence me...too much. Not just a majority voted for Obama, but a majority of undergrad or grad educated Americans as well....expressed there opinions, and I cant help but wonder. Who is the more rational right now? The person kicking the can and complaining about how Obama citizenship is British, or those who just happen to read a little history, actually watch both Fox and CNN and a little MSNBC while understanding that this is a democracy (in which the Majority decides on our presidential choice). my suggestion either have something really, well...bullet proof to say....or just quit complaining...for your own sanity. Gee. CNN you cover everything about the messiah. So who is he secretly e-mailing....? I wouldn't worry about his new comm device. You can imagine it talks to secured transmission equipment and is so far advanced from his old device that it only resembles it. #33 Larry said, "... When he became President, he lost the right to text message his family. Sorry, that’s the way it is." - Actually, he *does* have the right, and he is exercising it. I admire a president with the courage to say "Yes we can," instead of "It will never work."